28 inches and 16:10? Is this monitor just crazy enough to work? Solid image quality and PC-centric 16:10 aspect ratio in a 28-inch panel makes a great overall package. In the battle of the big, budget-priced screens there can be only one. One winner, that is. 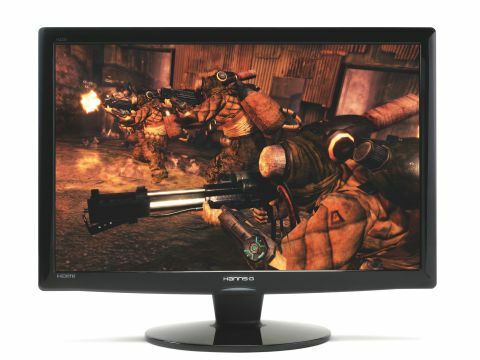 But will it be this 28-inch Hanns.G HZ281 monitor or its nemesis, the 27-inch Iiyama E2710HDS? The Hanns.G obviously squeaks it for acreage. It has a larger diagonal to the tune of a single inch. However, the HZ281 also sports a 16:10 aspect ratio to the Iiyama's 16:9. That makes the size differential in square inches even larger, but it also means the HZ281 has more pixels. Both screens pack 1,920 in the horizontal plane. But the Hanns.G ups the ante from 1,080 to 1,200 in the vertical. That's probably just as well given that the HZ281 is over £40 pricier. By most other metrics, it looks like a dead heat. We're talking TN panels, HDMI, DVI and VGA ports and tilt-only stands all round. May the best monitor win.